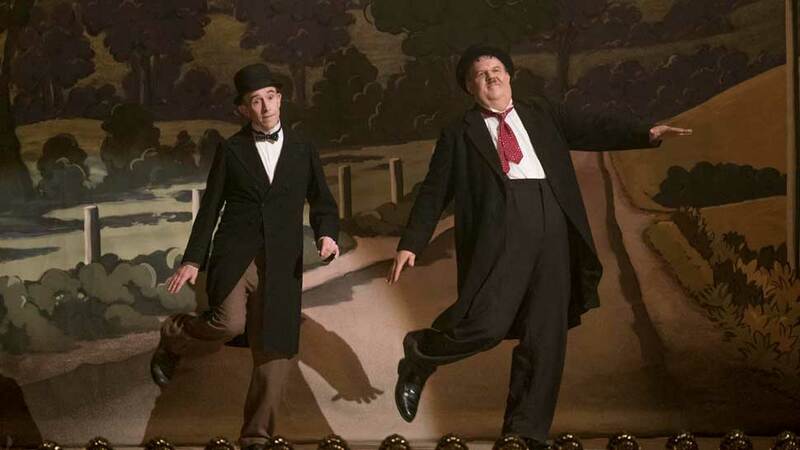 Both Steve Coogan and John C. Reilly are marvelous in their takes on Laurel and Hardy. Arguably, they’re at the finest when the film recreates or pays homage to the comedy duo’s most memorable acts. To make those scenes, as well as the film’s more emotional beats, truly work, chemistry and comic timing had to be absolutely spot on. Thankfully, Coogan and Reilly, along with director Jon C. Baird, get it just right. “Stan & Ollie” focuses primarily on what would end up being Stan Laurel (Coogan, “Philomena“) and Oliver Hardy’s (Reilly, “Kong: Skull Island“) final curtain call. Hoping to revive their film careers, the two undertake a tour of the UK in the early 1950’s. The tour turns out to be a hit, despite a slow start. More importantly, the pair showed they still “had it” years after audiences who still loved their films thought they’d retired. As the crowds grow, the venues get bigger. Eventually, the duo’s wives, Ida Laurel (Nina Arianda, “Florence Foster Jenkins“) and Lucille Hardy (Shirley Henderson, “Harry Potter and the Deathly Hallows, Part 2“) join them in the UK, bringing their own unique and strong personalities to the trip. However, the grueling tour does take its toll on the men behind the scenes. They’re not as young as they used to be, and as tensions mount old, unsettled issues from their days of glory resurface, threatening their comeback. “The Show Must Go On,” as they say. But how much longer this beloved duo can go on, as a team and as friends, comes into question as challenges continue to present themselves. 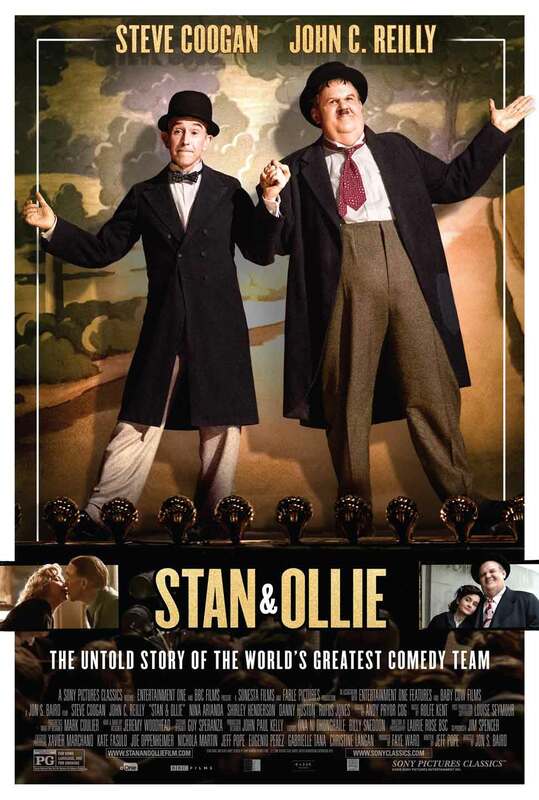 “Stan and Ollie” is based on the book “Laurel & Hardy: The British Tours” by A.J. Marriott. Working from a gentle and reverent script from writer/producer Jeff Pope (“Philomena”), director Jon S. Baird keeps the narrative focus tightly on Coogan and Reilly throughout the film. He banks on their chemistry the way Hal Roach Productions banked on that of the real-life Laurel and Hardy in the 1920’s and 30’s. His faith pays off immensely. Whether they’re dancing or riffing off each other on stage, bouncing lines off each other while traveling or finally airing out old grievances, the leads here completely disappear into their roles, and their rapport together is movie magic. Coogan, in particular, is tremendous as the tireless comedy craftsman Stan Laurel. He’s utterly believable as Laurel, the hard-working writing genius behind the duo’s success, who’s sometimes awkward around people but was never without a clever joke or gentle quip, especially when alongside Hardy. Reilly, meanwhile, delivers Hardy with some help from prosthetics, but his range shines through so that its never about the makeup and extra weight. Hardy was the people person between the two, and Reilly projects that geniality and charisma with practiced ease. Together, they depict nothing less than a love story. Not in the conventional sense, of course, but with its highs and lows, unspoken feelings and undeniable connection, it’s as palpable a love as you’ll see on film. Between the delightful work of the film’s leads, the truly impressive costume and make-up work involved in transforming them into Laurel and Hardy, and the emotional story that drives the film, “Stan & Ollie” absolutely should be seen by anyone who loves period films and stories about old Hollywood glory. It’s important to say that there’s real humor here, too. The gags, as familiar as they may be, still make you smile when brought to life this way. Give it a chance — you may find yourself wanting to watch some old clips of the real-life duo once you’re done. Starring Steve Coogan, John C. Reilly, Nina Arianda, Shirley Henderson, Danny Huston, Rufus Jones. Directed by Jon S. Baird.